Discover the best shopping places in Charlottenburg including Antique Mile, Bücherbogen, Autorenbuchhandlung,Diptyque Boutique und Hygge Interior. I hope you enjoy my top 5 shops in Charlottenburg. If you want to see more of Charlottenburg, you could also take a stroll on three recommended walks on the Charlottenburg map BertaBerlin. Charlottenburg off the beaten path, fare away from the Kurfürstenstraße, there are many hidden gems for shopping. 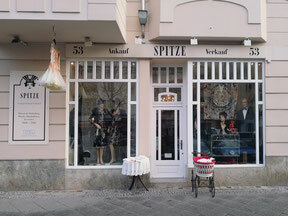 The Suarezstraße is the antique mile of Berlin: local antique, vintage and home decor shops invite you for strolling. 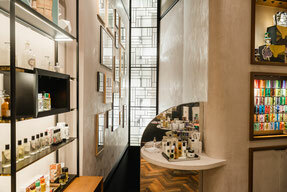 The very first Diptyque store was located in Paris. Their candles are beautiful and loaded with special fragrances. In 2016 they opened their first boutique in Berlin. The design shop is all about creating warmth and cosiness in your home. They offer Scandinavian inspired furniture and well-selected brands such as Vitra, Arne Jacobsen and Louis Poulsen. When I'm traveling I always visit one book shop, buy a book and mark the date on the first page. My little souvenir. 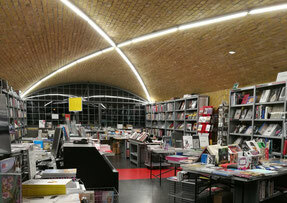 If you are a book worm yourself, Autorenbuchhandlung and Bücherbogen at Savignyplatz is a must visit. Bücherbogen provides a lot of storage and attractive display for thousands of international books, magazines, journals, and theoretical writing from art genres to architecture, design, fashion and children's literature. Almost every month they host a book launch or events, so it's always worth checking the website before going. Housed under three railway arches the real 'author's bookstore' offers a handpicked selection of over 28,000 books including poetry, philosophy, literature and cultural writing. 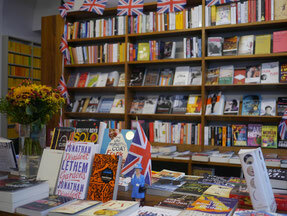 To the shop belongs an adjacent literary cafe, inwhich they host readings as well as lectures.